But sometimes they move in mysterious ways. In an election season dominated by Donald Trump, Muslims haven’t always been made to feel welcome in America. Meanwhile sales of halal food, prepared according to Islamic law, are surging — and not just among the fast-growing U.S. Muslim population: Adventurous millennial foodies are embracing it too. The Halal Guys food cart on West 53rd Street in New York. Shahed Amanullah could only find about 200 places that served halal food in 1998, when he launched a website to help Americans find it. Today, he’s tracking 7,600, and he says halal is making inroads even among people who are wary of Muslims. “Food is a great medium for cultural sharing,” Amanullah said. There’s a well-trodden path in America’s food culture, leading from ethnic-specialty status to the mainstream. It happened long ago with Italian cuisine, and to some extent with kosher food, which offers a closer parallel to halal. Like the Jewish equivalent, Islamic rules mandate humane treatment of animals as well as other special preparations. 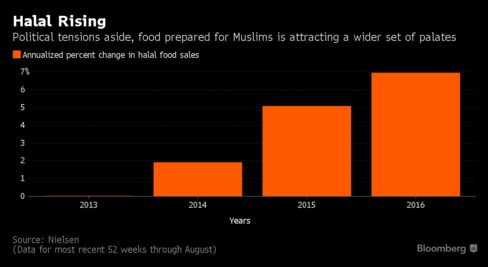 At every level of the U.S. food chain, halal already occupies a small but rapidly expanding niche. In grocery and convenience stores and similar outlets, research firm Nielsen estimates that sales reached $1.9 billion in the 12 months through August, a 15 percent increase from 2012. Whole Foods Market Inc., which has been among the pioneers, ranks halal among its fastest growing categories, with double-digit sales growth in each of the last five years. It’s been running Ramadan promotions since 2011. For early-adopting retailers, there’s been some flak — especially in the corners of social media where Islam comes under regular criticism. Amanullah said his “where-to-find-it” website is often used in such circles as a “who-to-boycott” guide — though he said such efforts typically backfire and end up helping his business. When Whole Foods ran its initial Ramadan campaign, it was criticized for failing to tout other religious holidays. Rick Findlay, global grocery coordinator for Whole Foods, says the company wasn’t deterred. A look at the demographics makes halal seem less of a risk. There were 3.3 million U.S. Muslims last year, but the number’s projected to grow to 8.1 million by 2050 — and about halfway through that time, Muslims will surpass Jews as the largest non-Christian religious group in the U.S., according to Pew Research Center. And that’s not the whole story. Adnan Durrani, chief executive officer of American Halal Co., estimates that as many as 80 percent of consumers who buy his Saffron Road brand aren’t trying to follow Islamic law — they’re just food-lovers who want better frozen meals. Saffron Road is a star performer at Whole Foods, and is also sold at branches of Kroger Co., Safeway Inc. and Giant Food Stores, among more than 12,000 locations. The market still hasn’t reached enough of a tipping point for some of the big names in packaged food to fully commit. Mondelez International Inc., the global snack giant, is a player in predominantly Muslim countries like Indonesia and Saudi Arabia, where halal is the standard. So far it only sells a handful of halal products in the U.S. Nestle, the world’s largest food company, has 151 halal factories, from Malaysia to Pakistan, and distributes hundreds of certified products across the world. But in America, Nestle mainly sells the food through its healthcare unit, which supplies hospitals. Something similar applies with retailers: Wal-Mart features halal products at about 400 of its 4,600 stores, and Kroger carries them only where there’s local demand. Ray is the author of the 2016 book “The Ethnic Restaurateur,” which examines a long history of immigrant influence on American cuisine. Italian food, he says, was frowned upon around the turn of the 20th century, partly because it was “too garlicky” and associated with criminal activity because people often drank alcohol alongside it. 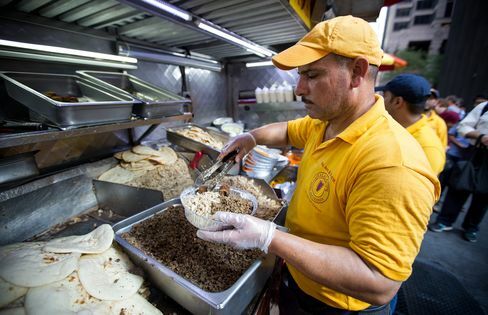 Halal Guys preparing a combo platter in New York. Durrani and Amanullah both recall being served kosher food when they were growing up: halal was hard to find, and for their families it was the next-best thing. Now, it’s easily available to diners-out, as well as eaters-in. 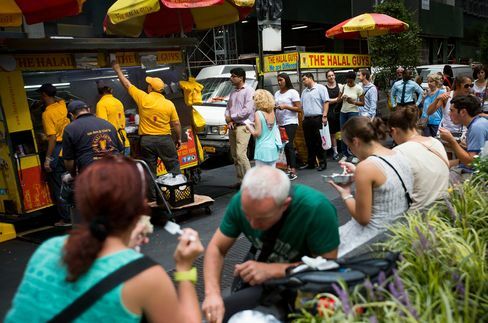 Some of the credit goes to Halal Guys, which started as a street cart serving meat dishes in New York City. They proved so popular that the company plans 300 sit-down restaurants across the U.S. in the next several years.